Real Name: Can not be pronounced. Group Affiliation: Freedom Force, formerly the Domain. Height: 6’ Weight: 180lbs Age: 58 Earth years. Instill powerful emotional states such as rage (“Instinct Dominance”). Stun another mentally by temporarily erasing all surface thoughts (“Cortical Suppression”). Suppress those states to help a teammate shake off mind control or other similar effects (“Cerebral Normalization”). 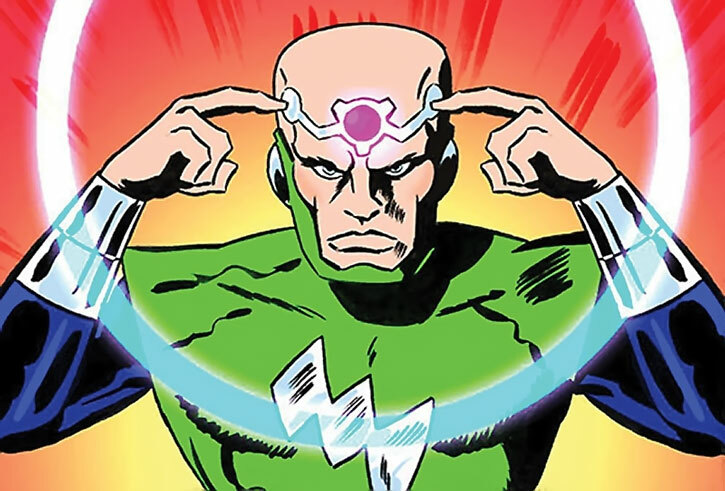 He can even use his enhanced cerebral energies to produce a moderately powerful burst of electromagnetic radiation (“Electron Beam”, “Phase beam”). In close quarters, this burst is even more powerful though harder for him to aim (“Energy Slash”). By focusing, he can also achieve a limited flight, though it is quite slow in comparison to his flying teammates. He is described in the source material as possessing telekinesis, but the only evidence of this is his flight ability. Mentor was also one of the Domain’s top scientists. He appears to be the top authority on Energy X. He also has been shown to be able to pilot Domain vessels, even dodging massed gunfire from trained fighter pilots for a while. Big head or not ? Explicitly stated as a member of The Domain, Mentor does not resemble any of his kindred in the slightest. The typical Domain has a slate, blue-grey skin, with a huge head and spindly limbs. Mentor, however, appears relatively human. Mentor has always looked the way he does – he’s a member of a different sub-species. The “big head” of his initial silhouette is just the helmet of a spacesuit he wore while piloting the ship carrying Energy X.
Mentor used to look like other Domain, but was, himself, exposed to Energy X. Due to his proximity to Earth and the human race when he was exposed, it changed him to resemble a Human. Mentor used to look like other Domain. But he used his time building the Freedom Fortress to also surgically alter his appearance somehow to resemble a Human. Mentor still looks like other Domain. But he either continuously projects a more human-like image into the minds of those around him, or possesses some form of shapeshifting ability that he uses to appear more humanlike. In the first three cases, the game stats are unchanged. However, in the case of #4, add Chameleon at approximately 3 AP’s or so. Other evidence, such as the fact that his gloved hands in the cutscene only have three fingers, imply that option #1 is actually unlikely. 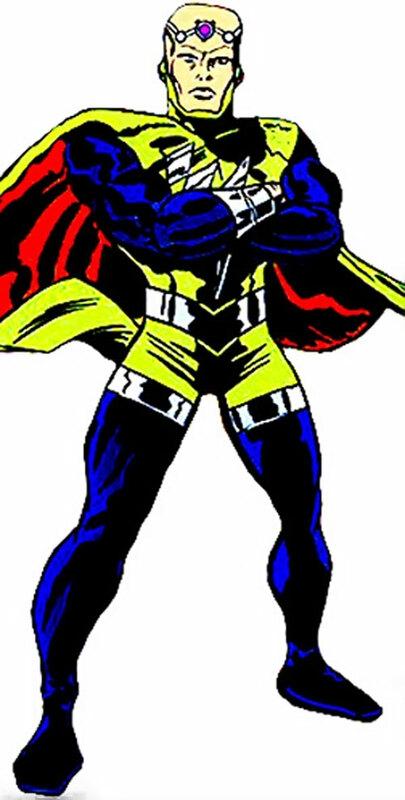 Originally a scientist among the Domain, he discovered Lord Dominon, absolute ruler of the Domain, planned on using Energy X to empower Earth criminals. Dominon’s goal was to sow chaos prior to a full invasion. Apparently the only one possessing a conscience, Mentor could not allow this to happen. So he stole the Energy X and a ship, fleeing the Domain. He was finally shot down in low Earth orbit, and his cargo scattered over Patriot City. He managed to land the damaged craft, somehow. Over the next several weeks or months, he built an underground base called the Freedom Fortress. Watching the recipients of Energy X and their actions, he approached Minuteman and explained himself, after helping him apprehend a Russian spy named Sukhov. Together with Man-Bot and El Diablo, they formed Freedom Force to protect Earth from whatever danger may befall her. 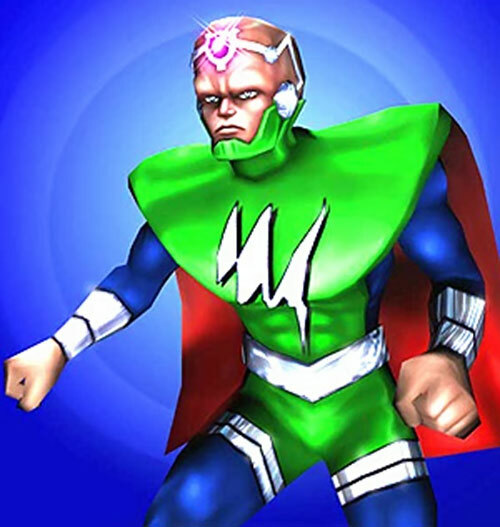 It is unclear whether Mentor’s powers are innate, or whether they are derived from Energy X.
Mentor appears to be a bald human with a bulging brow and slightly buggy eyes. He wears a green tunic that flows into his long green cape. The arms and legs of his bodysuit are dark blue, and he wears silver bracers, belt, and leg bands. His tunic covers his neck and lower jaw, but his head is uncovered except for strange metallic devices that may be functional in some way, or may be just decorative. At times stoic and at times VERY melodramatic, Mentor is at once dispassionate and angst-filled. He is very clear on what he perceives to be right and wrong, which fortunately mostly coincides with the general opinion of such. However he sees nothing wrong with mental probes or scans, especially as part of an interrogation. He rarely leaves the Freedom Fortress on missions, and keeps to himself quite a lot. Minuteman appears to be his closest friend, but he is willing to dispense advice to the rest of his teammates. He can be moody, and doesn’t hesitate to remind them of what he gave up for Earth if he feels they’re wallowing in their own angst a bit too much. 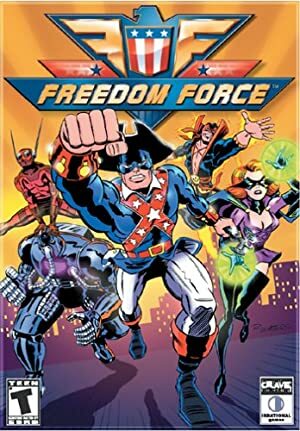 While preferably brought in whole cloth with the rest of Freedom Force to fill the gap in the 60’s, he could easily have been one of the aliens in Invasion, who tried to steal the Gene Bomb before it could be used. When that failed, he gathered many of the metahumans who resulted to form Freedom Force. Energy Blast(2) has No Range and No AV (-2). All powers are Contingent on Telepathy (-1). Mind Blast is rapidly healed – all victims regain one RAP per phase until the damage actually done by it (and it alone) is healed (-2). Mind Blast has no range (-1) but has an Area Effect (+1). Expansive HQ (The Freedom Fortress), Genius, Scholar (Energy X). Helper(s): Peter S Piispanen, Roy Cowan.